Following a concert at St Mary's church Uffculme when £275 was raised for the Karen Action Group Hemyock Singers returned to their own village the following evening to give a superb performance of The Creation' which raised £280 for St Margaret's Somerset Hospice New Build Appeal. This well-loved work showed Hemyock Singers at their best in a concert that included visuals, compiled by member Bob Brien, which were projected onto a screen There are a large number of solos in this work and Martin Warren (bass), Glyn Jones (tenor), and Jenny Doble (soprano) carried them with ease. Diction from them and the impressive choir of over 30 along with the crispness of singing, the blending of voices, strong entries, excellent organ accompaniment by Nigel Atkinson and well timed visuals made for one of the most impressive evening this Society has given in more than 30 years. Special mention must go to the chorus rendition of Awake the Harp, The Heavens Are Telling along with the bass aria Now Heaven in fullest Glory Shone and In Native Worth and Honour Clad tenor aria. The final chorus Achieved Is the Glorious Work' summed up the evening and congratulations must go to the hardworking members and in particular to musical director Ron White. 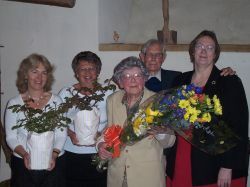 Following the concert a presentation of a cheque, rose bushes and floral bouquet was made to Joan Lawrence, the Groups Vice President. In thanking her Chairman Janice Bawler said that Joan had been involved with Hemyock Singers for over 25 years and had recently retired as the choral group's rehearsal pianist. Joan had been a source of inspiration and help to many, playing for stage shows and concerts. She had never been known to lose her temper no matter what temperamental producers and MDs had said, had done everything and more the group had asked of her and counselled wise words of wisdom The evening closed with light refreshments served by the Friends of St Mary's. Hemyock Singers next performance will be on Friday 13th July at All Saint's Church Culmstock with rehearsals commencing at Hemyock Baptist Chapel on Monday 14th May.